Media Release – Let’s Stay on the Export Wave!! 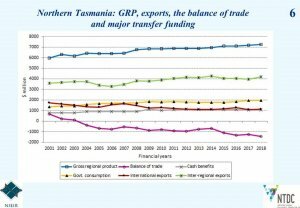 Whilst Tasmania’s increasing export activity, as reported in the July Deloitte Business Outlook, is a good sign for the State in general, we in Northern Tasmania need to do a lot more in the export sector if our region’s current uplift in economic activity is to be maintained and built upon. □ As a consequence, our annual trade deficit (read government dependency) has grown by $700M over the same period…. and therefore, now stands at $1.4B per year. If we are to become more self-reliant as a region our net export performance must improve. To achieve this, we have to continue to boost private and public sector investment in our exporting industries and their associated economic infrastructure …. and grow our population. John Pitt, NTDC Chair is available for interviews.